Founders’ Dinner honorees and hosts: (LtoR) President Hagan, Gil Smith, Pablo Portillo, Sascha Rice, “Sweet Alice” Harris, emcee Earl Hutchinson, Danny Bakewell, and Tim Watkins. 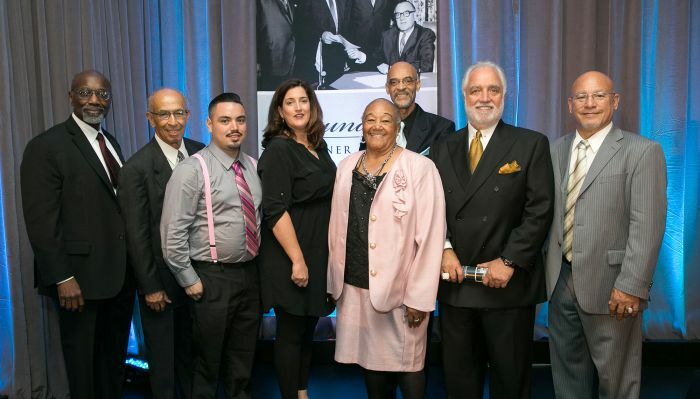 With more than 350 activists, civic and business leaders, educators and friends of the university in attendance, California State University, Dominguez Hills (CSUDH) hosted its Founders’ Dinner on Oct. 8 to honor those pivotal in the in 1965 selection of what would soon become the City of Carson as the location for the university. As the signature event in CSUDH’s year-long 50th Anniversary Watts Rebellion Commemoration—the devastating revolt that prompted the final decision to select Carson—the Founders’ Dinner also recognized those who have since worked tirelessly to help Watts residents, and those who have helped rebuild many of the South Los Angeles neighborhoods effected by the rebellion. Elegantly set in CSUDH’s Loker Student Union Ballroom, the Founders’ Dinner was emceed by CSUDH alumnus Earl Ofari Hutchinson (’89, M.A. 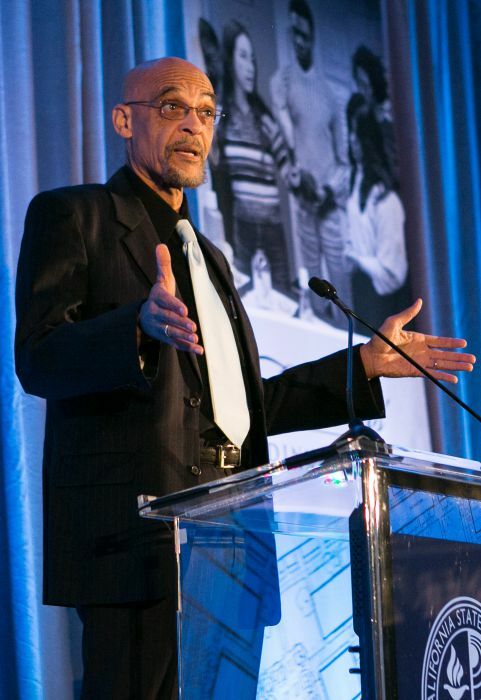 humanities), a civil rights leader, author, radio host, and political analyst. He provided a brief welcome before dinner, which preceded the evening’s program. After enjoying dinner and the soothing sounds of the Dominguez Hills Jazz Ensemble, CSUDH President Willie J. Hagan offered the formal welcome remarks to begin the Founders’ Dinner main program. During his address, Hagan read Langston Hughes’ poem “What happens to a dream deferred?” calling it “…one of most important questions one should ask about dreams, especially dreams about our aspirations and dreams about a desired future. If you know the Watts Rebellion, you know the answer to this question. A dream deferred will explode, especially when that dream has been deferred generation after generation,” he added. The first honoree of the evening was “Sweet Alice” Harris, a dedicated community leader and visionary who through the Parents of Watts organization she founded has committed countless hours and energy to address critical issues in Watts and improve the lives of its residents in the wake of the Watts Rebellion.